601. Jeff Eaton, “Eaton Family History,” http://worldconnect.rootsweb.com/cgi-bin/igm.cgi?o...3036646&id=I0045, December 29, 2004. 602. 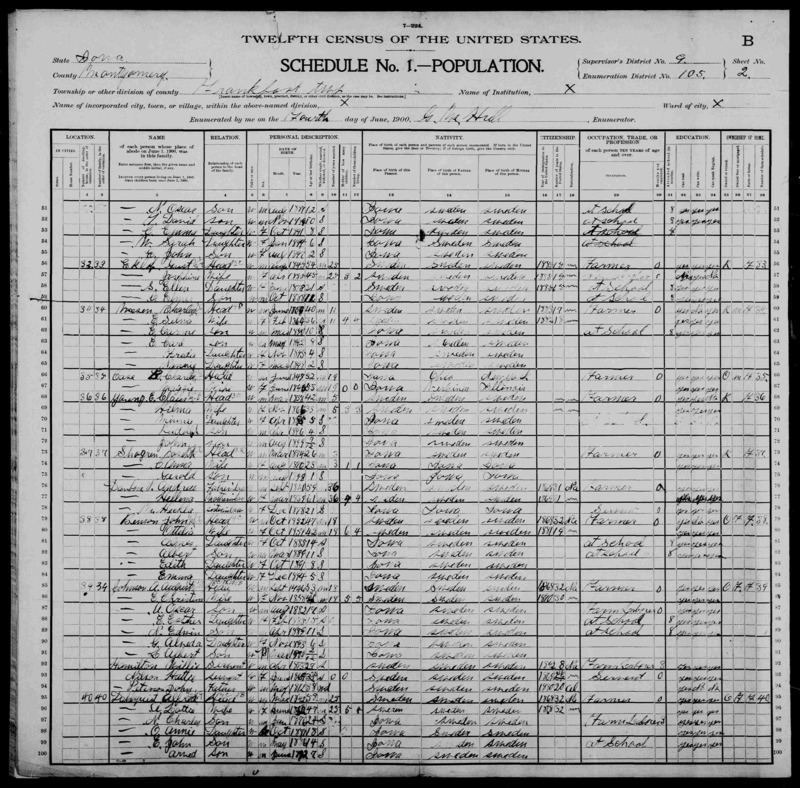 Fremont, Obion County, TN, October 20, 1860, “1860 United States Census,” Series M653 Roll 1267 Page 16. 604. Sue Webb Bodishbaugh, “Webb’s of Franklin County VA,” July 23, 2005, SWB-01. 605. Anne Webb Nelson, “Webb’s of Franklin County VA,” July 23, 2005, AWN-001. 607. “Obituaries,” Oil City Derrick, Oil City, Venango County, PA, January 6, 1978, Newspaper. 613. “Obituaries,” New Bethlehem Leader-Vindicator, New Bethlehem, Clarion County, PA, January 11, 1978, 9, NBL-001. 614. Lee/Webb Cemetery, Richard Webb, June 11, 2005. 615. Jackie Karpinski, “Tombstone Symbols,” http://www.rootsweb.com/~tncrocke/cemetery/symbols.html. 616. “Independent Order of Odd Fellows,” http://www.ioof.org/. 617. “Lincoln Township,” Chariton Herald, Chariton, Lucas County, IA, October 31, 1895, 7, CHH-001. The friends of Charles Larson, son of Carl Larson (lately deceased) will be pained to hear of his death which occurred October 20, caused from blood poisoning. He leaves a wife and one child to mourn his loss. 618. “Obituaries,” Mrs. C. J. Larson, The Chariton Herald, Chariton, Lucas County, IA, January 1, 1908, Front page, CHH-002. 619. “Marriages,” Adolph Noren and Emma Erlandson, The Chariton Herald, Chariton, Lucas County, IA, November 2, 1900, Front Page, CHH-003. 620. “Died,” Emma Larson Noren, The Chariton Herald, Chariton, Lucas County, IA, September 14, 1899, 2, CHH-004. 621. “Rev. A. Noren Died Monday Forenoon at home in Red Oak,” Chariton Herald-Patriot, Chariton, Lucas County, IA, July 26, 1934, 3, CHP-001. 622. “Obituaries,” Mrs. Ida Palmquist, Chariton Herald-Patriot, Chariton, Lucas County, IA, January 20, 1910, Front page, CHP-002. 623. “Obituaries,” Ellen G. Larson, Chariton Herald-Patriot, Chariton, Lucas County, IA. Ellen G. Larson, 85, daughter of G. N. and Emma Larson, was born Sept. 5, 1894 and passed away Jan. 15, 1980 at the Lucas County Memorial Hospital where she had been two days. She was born in Lucas county and spent most of her life on a farm east of Chariton or living in Chariton. She was a resident of McCollum Home for the Elderly for severa years, moving to Chariton Manor in June 1979. She is survived by her brother, Edwin Larson of Southgate Apartments, Chariton; a sister, Lillie Bingaman of Auburn, Calif.; one nephew, Edward Larson of Topeka, Kan.; four nieces, Trudy Sheldon and Dorothy Dixson of Chariton, Lorraine Howard of Ankeny and Betty Rowley of Coleville, Calif. There are 12 grand nieces and nephews. She was preceded in death by her parents and two sisters, Anna Larson and Minnie Wiren. She belonged to the Swedish Covenant Church and later Christian Union at Braden and 13th, and attended the First United Methodist Church. Funeral services were held Friday, Jan. 18, at 1 p.m. with the Rev. Gene Koth conduction. Burial was in Chariton Cemetery. Pallbearers: Loran Wiren, Walter Wiren, Edward Larson, Brent Larson, Paul Sheldon, and Wayne Dixson. 624. “Obituaries,” Anna Nathalie Larson, The Chariton Leader, Chariton, Lucas County, IA, May 1, 1962, 2, CHL-002. Anna Nathalie Larson, daughter of G. N. and Emma Larson, was born April 6, 1896, and passed away April 17, 1962, at the age of 66 years and 11 days. She was born and reared in Lucas county, living at the family home east of Chariton until they moved to 1413 Roland ave., in Chariton in 1945. She was a member of the Covenant church of Chariton and a faithful Christian. Surviving are two sisters, Ellen G. Larson of Chariton, and Lillie Bingaman of Applegate, Calif.; one brother, Edwin Larson of Chariton; one uncle, Otto Englund of Minneapolis, Minn.; one aunt, Dorothy Englund of Pasadena, Calif., and a number of nieces and nephews. Funeral services were held at the Beardsley-Fielding Funeral Home at 3:30 p.m. April 20, 1962. The Rev. Lester Hall officiated at the services. Interment was made in the Chariton cemetery. 625. “Obituaries,” J. Edwin Larson, Chariton Herald-Patriot, Chariton, Lucas County, IA, July 14, 1983. 626. “Obituaries,” Mrs. David Larson, Chariton Leader, Chariton, Lucas County, IA, February 20, 1940. 627. “Rites Wednesday for Mrs. Larson,” Emma Sophia Larson, The Chariton Leader, Chariton, Lucase County, IA, April 19, 1955, Front page, CHL-001. 628. “Larson Dies, Funeral Held in City Today,” The Chariton Leader, Chariton, Lucas County, IA, June 29, 1937, 1, CHL-003. 629. “RESIDED IN LUCAS COUNTY,” Chariton Herald-Patriot, Chariton, Lucas County, IA, April 1, 1926, Front page, CHH-005. 630. “Obituaries,” Carl Larson, Chariton Herald-Patriot, Chariton, Lucas County, IA, October 3, 1895, 3, CHP-006. 631. Emma Soffia Larson, “Lucas County Death Records,” April 18, 1955, Chariton, Lucas County, IA, 59-44, 253. 632. “Reported Deaths, Nashville Christian Advocate, 1905-07,” Nashville Christian Advocate, Nashville, TN, 1905-7, http://www.tngenweb.org/records/tn_wide/obits/nca/nca05-03.htm. 633. “Midway News,” Mary Lou Olson, “Mount Pleasant News,” Dianne Bremer, The Oberlin Herald, Oberlin, Decatur County, KS, Wednesday, March 24, 2004, 1, http://www.nwkansas.com/obhwebpages/pdf%20pages%20...205/3B%20KJ%2012.pdf. 634. “Obituaries,” McCook Daily Gazette, McCook, Red Willow County, NE, March 18, 2004, http://www.mccookgazette.com/story/1064427.html. 635. “Midway News,” Mary Lou Olson, The Oberlin Herald, Oberlin, Decatur County, KS, Wednesday, March 5, 2003, 1, http://64.233.167.104/search?q=cache:v3TuD5Dfl0kJ:...in+carlson&hl=en. 636. “United States Census,” 1900, IA, Montgomery, Frankfort, 2A-2B, 9, 105, T623, 1240450, 27, Bureau of the Census, US Dept. of Commerce, United States of America, June 4, 1900, Gilbert M Hull. 637. Joyce Johnson, “Gatlin family,” August 10, 2005, JOJ-001. 638. “The Common Thread,” February 21, 2007, Sam Maner, http://wc.rootsweb.ancestry.com/cgi-bin/igm.cgi?op...23&id=I589005232. 640. Deborah DeWeese Ralph, “Re: DeWeese Family Tree,” June 15, 2007. 641. Jennifer Lauck, “Re: webb,” http://boards.ancestry.com/mbexec/message/rw/local...920.1924.1928.1927.1, November 6, 2001. Reference is to Robertson County Archives Marriage Index. 642. “Pleasanton Weekly,” Pleasanton, CA, http://www.pleasantonweekly.com/morgue/2001/2001_05_18.obits.html. 643. August 24, 2005, Clarice (Webb) Jones. 644. “Dorris Cemetery, 15-22,” http://www.rootsweb.com/~tnsumner/cemdor.htm, http://freepages.genealogy.rootsweb.ancestry.com/~...rial_dorris15-22.htm, July 28, 2001. 645. Robyn Collins, September 11, 2005. 646. 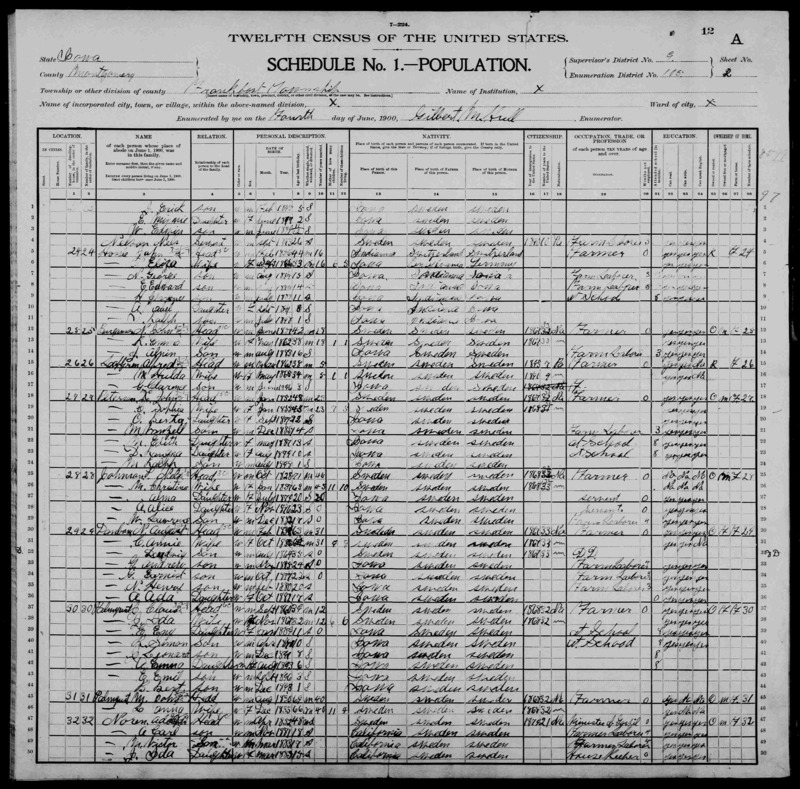 American Family Immigration History Center, “Passenger Record for Frederik Christiansen,” http://www.ellisislandrecords.org/search/passRecor...amp;pID=102996030113, January 23, 1906. 647. “Ancestors of Jack Morris and Carla Whiteman,” http://home.att.net/~jemjr/i371.htm#i570. 648. D J Webb, “Perfect DNA match!,” October 4, 2005. 649. “Sumner County Probate Records Guardian Settlements,” http://freepages.genealogy.rootsweb.com/~providence/court_guset1870.htm, 1870. 650. “Sumner County Inventories and Settlements, September, 1887 - November, 1909,” http://freepages.genealogy.rootsweb.com/~providence/estate_index_1887-1895.htm.